To invert the direct current voltage to alternating current voltage the opposite process of the rectifying process should be done. The problem is here that the natural commutations processes are not available and by that the use of passive semiconductors like diodes can not be used. To explain the process idealized switches are used. That means no switching losses, unlimited switching frequency, no switching delay and so on. 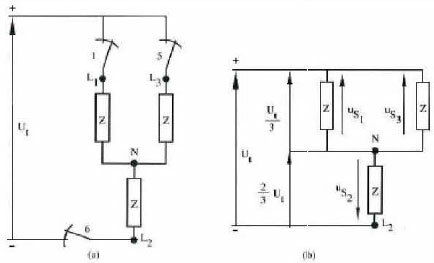 In a real circuit several options are available, dependent on the needed frequency, power or other important characteristics of the load. 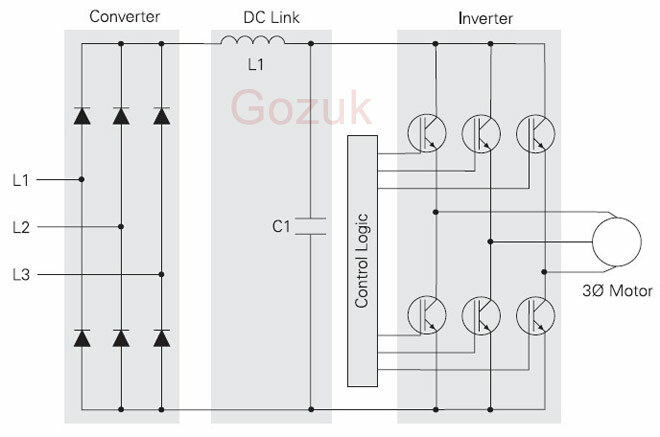 There are several methods to steer the inverter bridge but here the description is narrowed to the 180°-inverter principle. In the 180°-inverter there are at every moment three switches closed and three open. 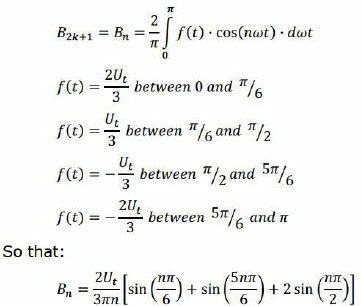 The principle is showed in following Figure. Of course the three closed switches are never in the same bridge half. 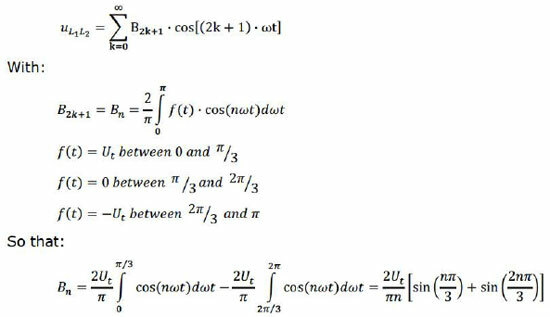 The following graphs, formulas and comments are in the assumption of a symmetric three phase load like an induction motor. To come to the graphs of following Figure several steps are made. Line wire one, indicated by L1 may never be connected with both positive and negative potential at once because this gives obviously a short circuit. The name 180°-inverter indicates that the switches are in one period closed for 180° and logically open for the remaining 180°. 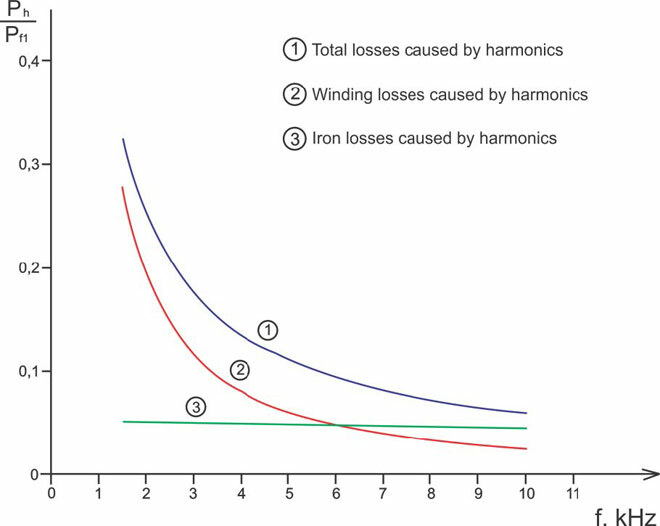 With t his in mind the graph of uL1 can be found. It gives t he potential from line L1 in reference to the negative pole of the direct current voltage source. 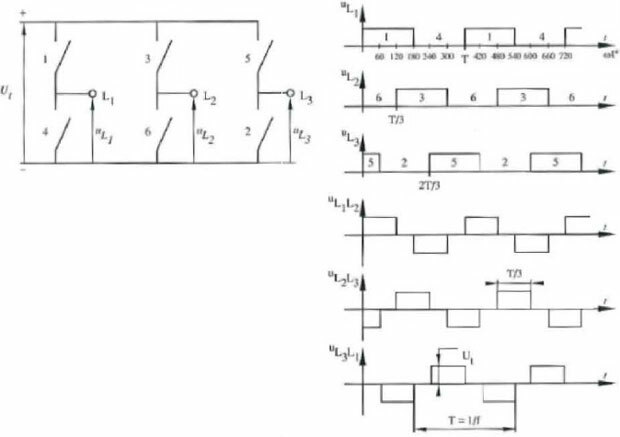 The principle is to get a symmetric process with no short circuits or points where the three switches of the same bridge half are together closed. 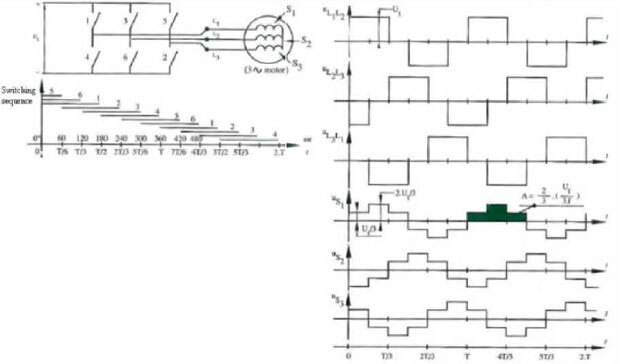 Here for the switching process of the other lines is similar but the course of voltage uL2 is 120° shifted and the course of voltage uL3 is shifted 240° according to uL1 With this in mind three line voltages can be defined. Line voltage uL1 L2 is the potential between line wire L1 and line wire L2 or maybe more easy to see the difference between uL1 and uL2 Line voltages uL2 L3 and uL3 L1 are defined analogue as the difference between u 1,2 and u1,3 respectively the difference between uL3 and uL1 Like showed in the lowest graphs of Figure klklk the line voltages are block shaped. The numbering of the switches is standard and analogue as the numbering of the diodes in a rectifier. By this at every moment three consecutive switches are in conducting state. There the motor coils are inductive loads, the form of the current will be exponential when the voltage has a stepped shape. Because the connection of the two switches in the same phase would give a short circuit and the switches (even when they are electronic) are not ideal, a dead time td between the opening of the one and the closing of the other is needed. From previous chapter is cl ear that the 180° steering of the inverter bridge causes too many harmonics. The control of the speed of an induction motor by varying the frequency of a 180° steering is thus not the ideal solution. Another possibility is the variation of the pulse width to get a better approach of the sine wave. 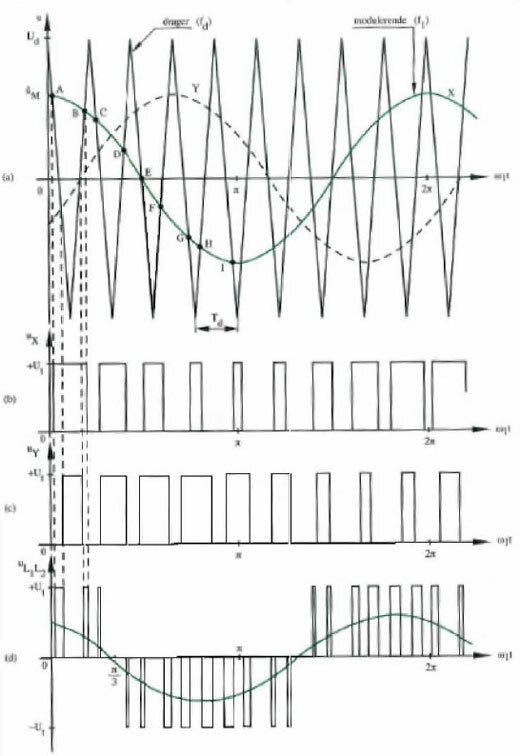 This technique is called pulse width modulation. 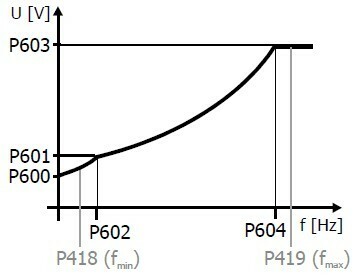 The operation of the pulse width modulation inverter, often shortened to PWM, can be explained with use of following Figure. 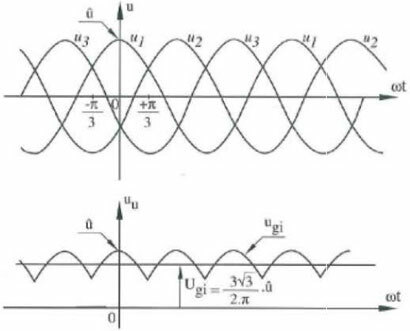 From the Figure (d), which gives the line voltage uL1 L2, it is clear that the output signal isn't a smooth sine wave and it will thus contain also harmonics. The maximum of the triangular wave is synchronized with the maximum from the three sine modulators. This is called synchronous modulation. Because of this the intersections of modulator and carrier are more easily found.